Reflecting back on our lives while reminiscing with an old friend at lunch today, my heart turned to you, Bob. I miss you, my friend! You're spirit and joy will remain here with us always. Was just thinking about last summer's ABB show in Pittsburgh. Quality gathering for our friend. A number of us got to meet Bob over a magical weekend several years ago in Pittsburgh. That whole experience exemplifies to me what this place is all about. Nearly 30 of us, from all over the US and Canada, aware of Bob’s struggles at that time, went to Pittsburgh to attend an ABB concert. Bob was unable to travel any real distance, and being the devout family man that he was, really didn’t entertain the idea of traveling to any far away concerts. His girls liked the beach, so, if a vacation was taken, to the beach is where they went. So the bunch of us went to him. 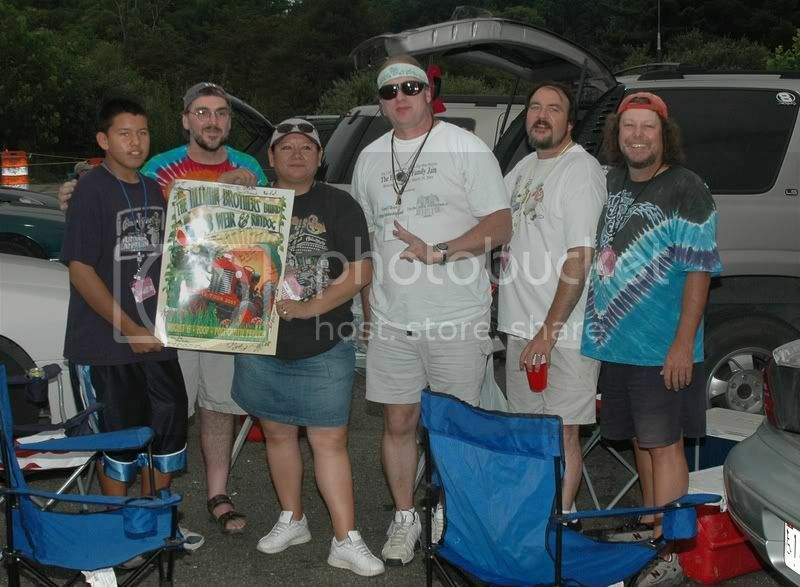 What all of us had in common that were able to attend BoboFest was the love for Bob and the desire to spend some real quality time with him. I didn’t make the final decision to attend until only ten days or so before the show. It’s one of the smartest decisions that I’ve ever made in my life. Really, I knew that I had to go. There wasn’t any other choice. All of us were drawn together by a website of all things. Diverse people, diverse ideas, different in many ways but connected by our caring about and compassion for Bob. He told me many times what that meant to him. He found it hard to believe that so many would make that kind of effort to meet and get to know him. Over the last several years we talked at length many times. There were ups and there were downs. What amazes me most about Bob is during all these difficult times for him, emotional and physically, he always asked about others. He was concerned for their wellbeing, he wanted me to say hi to people when the disease made it difficult for him to do simple every day things like using his computer. He never lost sight of how much people cared for him. He gave that and much more back. I browse several photo web sites and forums. From the online lab I use, Mpix, and it's "General Discussion" forum. One member was doing the Relay For Life walk and wanted forum users to give her a name of someone they knew who was touched by the disease, be it survivor, currently under treatment, or other. She was going to do one lap for each name she got. Being a photographer, she had a friend take a picture of each lap's dedication. I left a link on the Mpix site to Bobo's threads. The Bobo thread....OMG.....I just went through parts of it.....many many pages of love and support until the end....these people, they truly show what I've learned here as well, that you don't have to physically have a family....I am SO in tears now, what an amazing person 'Bobo' was Thank you for sharing that...thank you. This is very cool, Ron. That is really heartwarming Ron! Good Ol' Bobo, miss him lots.